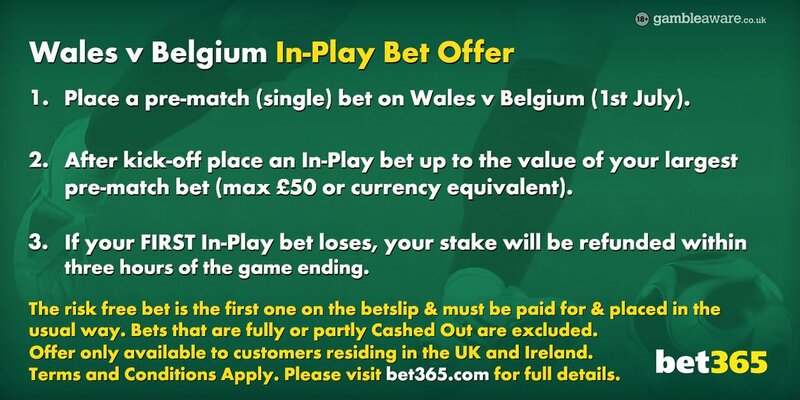 World leading bookmaker Bet365 are once again offering their fantastic In Play offer on Friday's Euro 2016 Quarter Final between Wales and Belgium. The offer is available to new and existing customers. Find here how to get £50 risk-free to use In Play during Wales v Belgium. Bet365's usual offer is the most appreciated by UK punters (and worldwide) as this is an easy opportunity to boost their betting balances at the expense of the world's biggest bookmaker! Plus, you can claim a €/£200 welcome bonus! Enjoy the best betting promotion offered by bet365! 4. Get a refund if it loses! If you don't have a bet365 account then sign up here and take advantage of this offer as well as of their first deposit bonus of up to £200. There is no need to opt in to claim the offer, simply back your pre-match bet on the game and once the match gets underway, select your in-play wager and place it as usual. If the second selection loses, the stake will be refunded directly into your account a few hours after the final whistle. These refunds are in cash, not free bets, and there are no wagering requirements, use the funds however you wish. Unlike some firms bet365 don't place restrictions on their free bets so the refund is paid as cash, and not as bonus funds. Most bookies offer 'refund as a free bet', which means that you must then spend the refunded cash in one bet and returns are often calculated without the free bet stake. This is not the case with bet365. If you win your in-play bet then you keep your winnings and if your bet is a loser then the stake (up to £50) will be credited into your account immediately. Stake £50 on "Over 0.5 match goals" pre-match as qualifying (to win this bet you need 1 or more goal in the game). Once the game has kicked off, go for a correct score at a bigger price. Eg: 1-1 Draw at 6/1. Good luck and enjoy the offer! This offer applies to bets placed on the Wales v Belgium Euro 2016 match, played on Friday 1st July 2016. Risk free bet value will be equal to the stake of your largest pre-match single bet placed on the Wales v Belgium Euro 2016 match, played on Friday 1st July 2016, up to a maximum of £50*. Pre-match bets that are fully or partly Cashed Out will not qualify for the offer, whether Cashed Out pre-match or In-Play. The largest pre-match bet that has not been fully or partly Cashed Out will qualify (up to £50*). Risk free bet will be deemed your first single bet placed In-Play on the Wales v Belgium Euro 2016 match, played on Friday 1st July 2016. If your first single In-Play bet is fully or partly Cashed Out, you will no longer be eligible to receive this offer. Note that 'pre-match' is defined as bets placed prior to kick-off of the Wales v Belgium Euro 2016 match, played on Friday 1st July 2016 and 'In-Play' is defined as any bet struck after the game has kicked off. Both your pre-match and In-Play bets must be paid for in the usual way. If your risk free bet loses, we will aim to refund your stake to your account within three hours of the end of the game. Maximum risk free bet per customer is £50*. Where more than one In-Play selection is placed on the same bet slip, the risk free bet will be deemed to be the one which is first on the bet slip. This offer only applies to bets placed via desktop, mobile or tablet. Bets placed using our Telephone Betting service will not qualify for this offer. Where any term of the offer or promotion is breached or there is any evidence of a series of bets placed by a customer or group of customers, which due to a deposit bonus, enhanced payments, free bets, risk free bets or any other promotional offer results in guaranteed customer profits irrespective of the outcome, whether individually or as part of a group, bet365 reserves the right to reclaim the bonus element of such offers and in their absolute discretion either settle bets at the correct odds, void the free and risk free bets or void any bet funded by the deposit bonus. In addition bet365 reserve the right to levy an administration charge on the customer up to the value of the deposit bonus, free bet, risk free bet or additional payment to cover administrative costs. We further reserve the right to ask any customer to provide sufficient documentation for us to be satisfied in our absolute discretion as to the customer's identity prior to us crediting any bonus, free bet, risk free bet or offer to their account. All customer offers are limited to one per person, family, household address, email address, telephone number, same payment account number (e.g. debit or credit card, NETeller etc), and shared computer, e.g. public library or workplace. We reserve the right to withdraw the availability of any offer or all offers to any customer or group of customers at any time and at our sole and absolute discretion. Offers only apply to customers who have made an actual/real money deposit with bet365. Bet365 £50 free in-play bet on Atletico Madrid v Leicester. Risk-free! Bet365 offer £50 free in-play bet on Barcelona v Manchester City - Risk-free! "Belgium v Wales £50 free bet to use in-play at Bet365"